﻿A $45 Value, just $36.99!! BOOST MUSCLE GROWTH & RECOVERY: mTOR promotes lean muscle growth with 5g of instantized 2:1:1 BCAAs L-Leucine, L-Isoleucine, L-Valine, and EAAs: L-Lysine, L-Threonine, L-Phenylalanine, L-Tyrosine, L-Histidine, L-Methionine. TIME RELEASE L-LEUCINE: ActiveTR is a revolutionary ingredient that causes a release of an extra 3 grams of leucine three hours after consumption for a constant supply of leucine to your muscles. ACTIVE HYDRATION MATRIX: We've added Taurine and Electrolytes to keep your muscles hydrated to increase the efficiency of your muscle recovery. GREAT TASTE: mTOR PRO tastes incredible and comes in 3 mouth-watering flavors: Fruit Punch, Blue Raspberry, and Mango Lemonade. This intra-workout supplement will quench your thirst and increase your muscle recovery at the same time. INCREASE ABSORPTION: AstraGin works to improve the absorption of your supplement, magnifying the effects of your BCAAs. 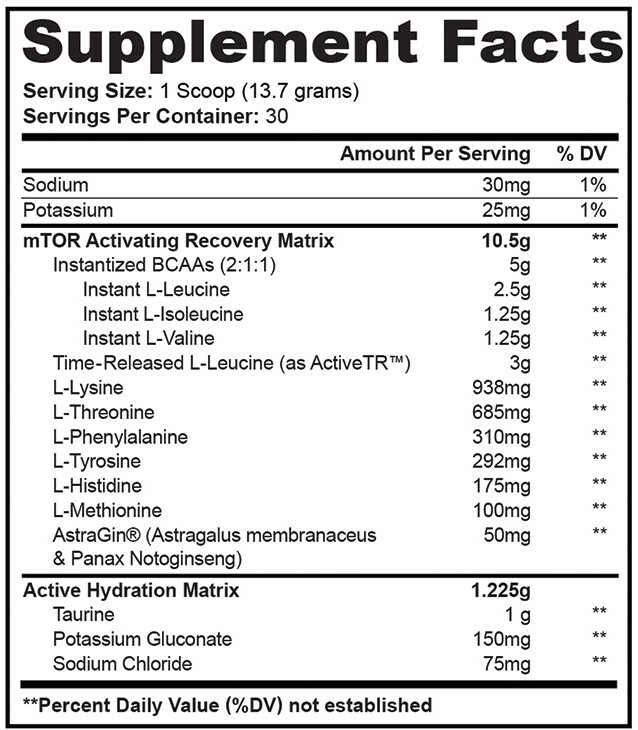 mTOR PRO is the only bcaa supplement to include AstraGin. After a long, intense workout, your muscles need the right fuel to repair, rebuild, and recover, which is when you turn to mTOR PRO. Developed with years of testing, research, and clinical trials, mTOR PRO features a unique formula of natural ingredients that work together to improve muscle recovery, promote endurance, and supplement your overall athleticism and physical performance. That all equates to longer, harder workouts and faster gains. The main component of mTOR PRO is its unique 2:1:1 BCAA ratio combined with 10.5 grams of essential amino acids with every serving. The supplement works by signaling mTOR, an enzyme that triggers the process of cell division and growth, allowing for muscle repair and more energy. mTOR PRO is also the only supplement on the market that uses ActiveTR, a time-released form of L-leucine, which is the main amino acid involved in the muscle protein synthesis process. mTOR PRO utilizes Astragin to increase the absorption of potassium, BCAA, amino acids and other vitamins and nutrients. Astragin improves bioavailability to ensure that you get the right amount of nutrients in your bloodstream and take full advantage of the benefits and effects of this recovery supplement. Along with a healthy share of amino acids, mTOR PRO includes an active hydration matrix that comprises taurine, sodium chloride, and potassium gluconate. MYOKEM is home to a wide range of diet and bodybuilding supplements that have been carefully crafted through research and development. We provide a detailed list of ingredients and measurements so that you know exactly what is in the supplement and what you are putting in your body. Choose mTOR PRO to get the branch chain amino acids you need for better workouts, better recovery, and better gains. As a dietary supplement, mix one (1) scoop of mTOR PRO with 12-16 ounces of cold water. On training days, consume during workout. On non-training days, consume throughout the day for added recovery. For enhanced results, consume two (2) servings per day. Drink plenty of water during training to avoid dehydration. Slight foaming may occur when mixed with very cold water. This is normal and will dissipate after a few minutes. Contents may settle after shipping. Shake container prior to each use to redistribute ingredients. May not be suitable for persons under the age of 18.